If you’re a first-time parent, it can be challenging to learn and navigate the various doctor appointments for your infant child. If you count just the recommended pediatrician visits alone, you can expect to take your child to the doctor at least six times in the first year of his or her life. Add unexpected ear aches and colds and that number can double. Knowing this, it’s not surprising that many parents overlook getting their little one into the dentist for the first time. At Alligator Dental in Seguin and San Marcos, our children’s dentists look forward to meeting with parents and children to become a partner in and pave the path for lifelong oral health. 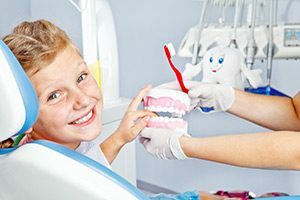 If you’re looking for a reputable children’s dentist, give us a call! We’d love to speak with you! We recommend you schedule an initial dental visit within six months of your child getting his or her first tooth (or between six and 12 months) and, in today’s article, we will take a look at what you can expect during the first visit to our office with your little one. The first thing that commonly takes place at a child’s first dental visit is an introduction to the dentist and his or her staff. It can be beneficial for this introduction to take place in a neutral setting like the waiting area versus the exam room so that your child is not scared by a new person right before the exam. Meeting the staff and familiarizing yourself and your child can go a long way in making both of you feel comfortable. In addition to meeting the office staff, you may also receive a tour of the facility so that you feel even more comfortable. Check out photos of our San Marcos and Seguin offices and staff to get a feel for each office! Since your child is very young, his or her first dental appointment will likely be different than a routine appointment. The pediatric dentist will perform an oral exam that may include checking out and counting the number of teeth your child has gotten in, examining his or her gums and tongue, and inspecting his or her bite and jaw. At Alligator Dental, our children’s dentist will perform a “knee-to-knee” dental exam with you and your child. During the exam, your child sits on your lap facing you while you face the dentist. Your child will then be laid back so that his or her head is in the dentist’s lap for the exam. This way, your child can be comforted by your presence while receiving his or her exam. Once the dentist has examined your child’s teeth, mouth, and jaw, he or she will take the opportunity to review good oral hygiene habits and eating habits. Because your child is too young to do many things by himself, much of this discussion will be geared in how you can begin to teach your child healthy habits for good oral health. The two of you may discuss topics such as how to comfort your child during teething, pacifier use and thumbsucking, and/or healthy diet choices. While you and the dentist discuss these items, many dentists, including Alligator Dental, will have age-appropriate toys for your child to play with so that you can focus as much as possible on the topic at hand. After this educational discussion, you’ll be provided with the opportunity to ask any questions you might have. It can be helpful to write down your questions ahead of time so that you don’t forget to ask one inadvertently. Once your child’s first dental visit is complete, you’ll have the opportunity to schedule his or her next follow-up appointment for about six months down the road. As a Top Rated Local® Dentist in San Marcos and Seguin, we look forward to being your first choice when you’re searching for a compassionate and professional children’s dentist. We offer online payments and comprehensive information for new patients. Contact us today to schedule your child’s first appointment! We look forward to speaking with you!